This is a reference for the components found on the Palette. 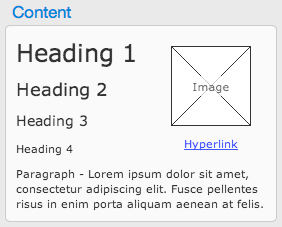 Contains basic components for adding text, images and links to your designs. Heading 1-4 – First through fourth-level heading text. Paragraph – A paragraph of rich text. Image – An image placeholder. Contains interactive controls used for building forms and application interfaces. Controls can respond to user interaction, similarly to the Automatic Navigation components. Note: By default controls appear in the default style as determined by the web browser and operating system you are using. You can customize their appearance using the Appearance section of the Inspector. Form Field Label – A text label for a form field. Tooltip – A text tooltip. 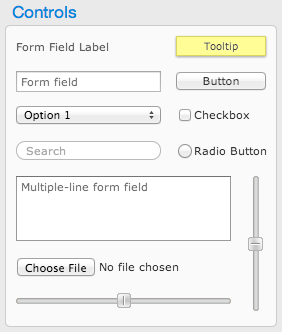 Form Field – A single-line text form field. Drop Down Selection – A drop-down selection menu. Search Field – A form field styled for use as a search field. Radio Button – A radio button. Multiple-line Form Field – A multiple-line text form field. File Upload – A file upload form field. Sliders – Horizontal and vertical sliders. 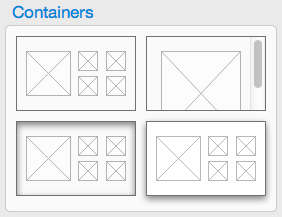 Contains several box and line styles for quick sketching. All of the boxes can optionally contain text, which defaults to center-alignment for quick labeling. Rounded Box – A box with rounded corners. Circle – An ellipse or circle. Lines – Thin and thick horizontal and vertical lines. Dark and Light Masks – Semi-transparent dark and light overlays, used to mask other content. 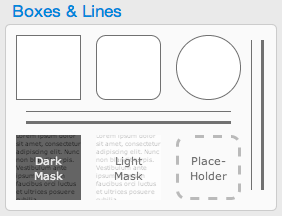 Placeholder – A box styled as a place-holding outline. Contains pre-configured navigation components that automatically link between pages or state values. Horizontal and Vertical Page Navigation – Page-based navigation, pre-configured to show the top-level pages. Horizontal and Vertical List Navigation – State-based navigation, pre-configured to switch between three items. 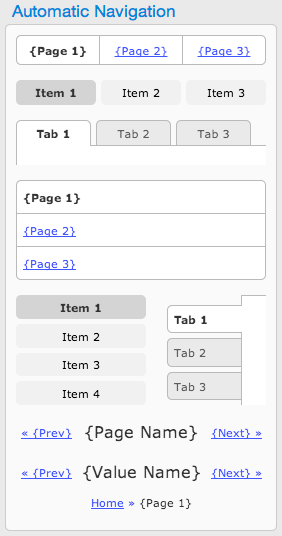 Horizontal and Vertical Tab Panels – A pre-configured 3-tabbed panel made up of state-based navigation and containers. Previous and Next Links – Pre-configured links to the previous and next pages or state values. Current Page Name – Displays the name of the current page. Current State Value Name – Displays the name of the current value of a state. Page Breadcrumbs – Breadcrumb navigation, pre-configured to show all pages from the project home page to the current page. Container – A basic container. Scrolling Container – A container that is configured to allow scrolling when it contains large amounts of content. Well Container – A container styled to appear sunken into the page. Floating Container – A container styled to appear to float above the page. This is commonly used to create pop-up dialog boxes. Contains components used to display complex content that is beyond the scope of the components above. 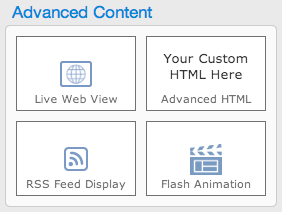 Live Web View – A live web view, used to display an existing web page. RSS Feed Display – An RSS feed component, used to display an RSS feed. Flash Animation – A flash animation component, used to display an Adobe® Flash® animation. 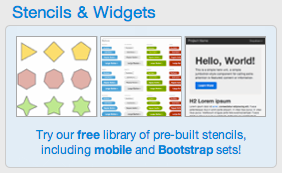 Provides quick access to the Stencils and Widgets Library, which contains thousands of additional pre-configured components and stencils. All items in the library are created from the same basic components as the items on the palette.